Qin MingHe is a survivor of severe child abuse. When he was just five years old, his neighbor, jealous of his academic and athletic success, hatched a malicious plan to end the boy's popularity. She lured him into her home, tied him up, placed him upside down in a hole, covered his body with hay, and set him on fire. 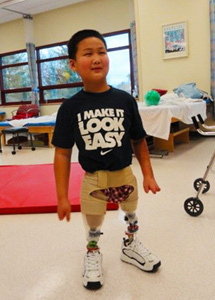 MingHe miraculously survived, but lost his fingers and most of his legs. MingHe's dream was to walk again on prosthetics so that he can move and function independently in a society that is largely not wheelchair-accessible. With the help of the Shriners Orthopedic Hospital for Children in Springfield, Massachusetts, MingHe's dream is now a reality. Shown here on stumps designed by prosthetist Brock McConkey, MingHe is now learning to walk again on fully-equipped prosthetic legs. 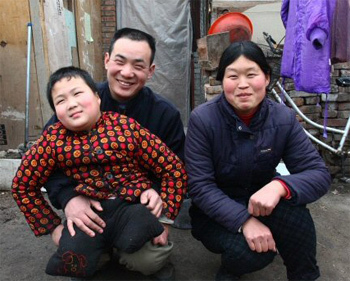 MingHe will return to Springfield every 13 months to receive continued rehabilitation and new prosthetic legs. We saw Minghe yesterday at Shriners Srpingfield. His big smile lights up the room where ever he goes. He has grown so much. Now at 77 pounds he is moving well on his prosthetic legs. Brock has made new legs for Minghe. He will be two inches taller when he leaves next week.